Kiss cutting leaves your finished part on a removable layer of paper or foil. 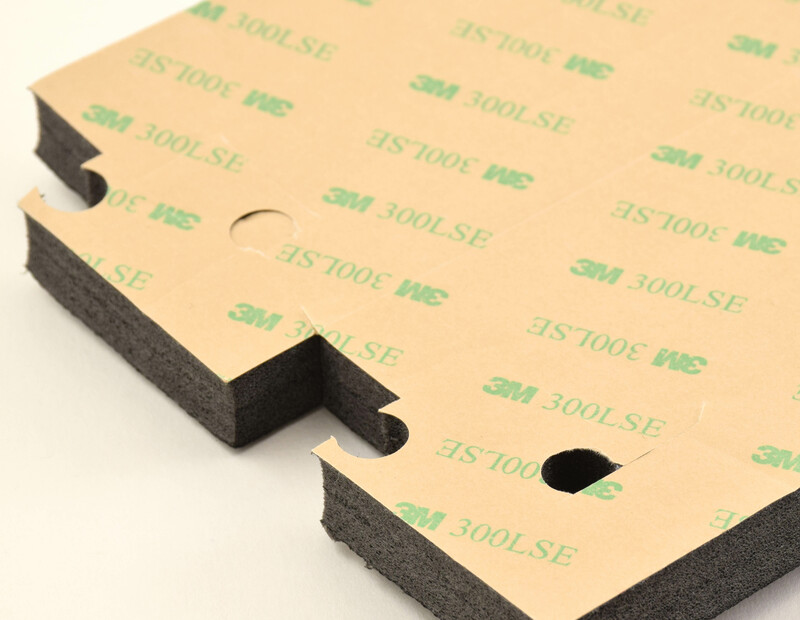 Your part stays on this layer until ready to be peeled off and used, making transportation, organization and application easier for both you and the end user. You probably see and use kiss cutting all the time. Companies kiss cut common consumer and commercial products, like stickers, felt pads and hanging hooks. You should use kiss cutting when your end user would find it easier to peel a part off of a large backing sheet (instead of peeling the backing off a part of the same measurements). Have a large set of parts that need to stay grouped? Our materials techs can assemble several finished parts onto one backing layer. The name “kiss cutting” comes directly from the process. A layer of raw material—like foam or rubber—is placed on top of the removable paper layer and sent through the kiss cutting press. A sharp steel blade cuts all the way through your part material, but only touches—or “kisses”—the layer of paper or foil. This leaves your shaped product and backing layer intact. Wondering if kiss cutting is right for your parts? Give us a call to talk with one of our engineers. We’ll help you decide which type of shaping is best for your project.